Exporters in Tamil Nadu presented their plight of non receipt of refunds since the implementation of Goods and Services Tax to Union Finance Secretary Dr Hasmukh Adhia at a meeting held at the Federation of Indian exporters Organization on March 2. Senior officials of the Customs and the Tamil Nadu government were present during the high level meeting with the Exporters. They include Additional Chief Secretary and Commissioner of State Taxes Tamil Nadu Government Dr.C.Chandramouli, Principal Commissioner of GST and Central Excise C P Rao and Chief Commissioner of Customs Ajith Kumar. Highlighting the plight of exporters Dr. A. Sakthivel, Regional Chairman, FIEO pointed out that huge number of refund claims of IGST as well as ITC refund is pending due to errors in the system. He requested the Finance Secretary to operationalize refund module in the GSTN portal immediately which he said will solve all the issues of exporters. He also requested for urgent attention on resolving the issues related to errors which has been occurred due to system issues as well as ignorance from the side of exporters. The problem is by and large of MSME units who are predominantly in exports as they cannot use their ITC of IGST paid elsewhere. We would need to extend the IGST exemption facility to Advance Authorization, EPCG, EOUs, etc. beyond 31st of March, 2018 on a perpetual basis as not much has happened on development of e-wallet facility. The prior import condition on Advance Authorization may also be withdrawn so as to give necessary flexibility to exporters to manage his inventory. EU also provides VAT exemption on inputs required for exports and has no such prior import requirement. Lot of exporters exporting through ICD are awaiting IGST/ITC refund as EGM by the shipping lines at the gateway ports have not been filed or incorrectly filed. The duty drawback on exports is given at the Let Export Order (LEO) stage and the same should be accepted for IGST refund to expedite the same. The Advisory Group on GST has recommended for suitable change in the Law to reflect it. However, in the meantime, the Customs/Tax Authorities should accept the Bill of Lading (B/L) issued by the shipping lines with on board date as a proof of exports. The B/L contains the invoice number etc. which can be matched with shipping bill and GSTR. Many exporters have not been able to file ITC refund in the Form given in RFD-01A as they are required to give a declaration that they have not claimed and shall not claim drawback. The drawback is given for the basic customs duty and therefore, exporters are entitled for drawback along with GST refund and the declaration may accordingly be withdrawn. During July-Sept,2017, exporters were given the option to claim composite (higher) drawback forgoing IGST/CGST claim. In respect of many products, the drawback rate only factors the customs duty. Therefore, the duty drawback rate with Cenvat facility as well as duty drawback rate without Cenvat facility is the same. In such cases, even where exporters have referred to as having claimed higher drawback, the same should be ignored and IGST refund may be given to such exporters. Lot of cases can be cleared if the software can ignore higher/lower drawback rates in cases where both the rates are the same. Apparel, Textiles and other sectors are losing competitiveness due to impact of embedded taxes on account of non-coverage of petroleum and electricity in the GST. Moreover, in many cases, the end raw material is exempted from GST while the inputs required for manufacturing of raw material bear GST. In all such cases, the tax is embedded in the supply value. Such embedded taxes of Central Taxes may be factored in the duty drawback scheme and State Taxes by way of ROSL to provide competitiveness. Modification Rule-96 consequent on Notification 3/2018 dated 23.1.2018 which has been retrospectively amended w.e.f. 23.10.2017 mandating exports of goods procured by merchant exporters at 0.1% only through LUT route. A large number of exporters executing such transactions have exported under IGST paying the full amount which needs to be refunded through IGST route. The refund module in the GSTN portal should be made operational immediately. The manual refund, in any case, has added to the transaction time & cost. It has been experienced that Tax Authorities in each place insisting for submission of different type of documents for acknowledging manual refund application. The requirement of documents need to be standardized. Department also requested not to ask for piecemeal information/documents for processing. 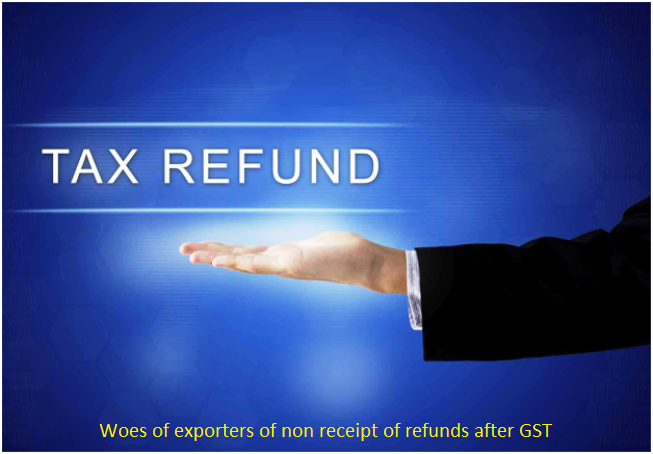 Exporters are facing delay in getting refund due to EGM errors even though duty drawback has been processed and paid. It has been noticed that EGM errors happening due to faulty system as it has been pointed out by the shipping line, CHAs etc. that irrespective of repeated correcting of errors, claims could not scrolled. A proper system may be devised to attend EGM related issue ina scientific manner. There is one issue related to the formula for calculating refund of accumulated ITC, where we have to give input credit availed during the period (which is for the month only). For example, if purchases are in Aug.17 and export took place in Sept.17, I�ll not be eligible to take refund of accumulated ITC for the month of August since the export made in subsequent month. This has to be rectified. The input credit availed during the period should include opening accumulated credit also. The trade and industry facing problem even filing the basic returns and has to depend on experts. While larger firms can have expertise on the subject, the MSMEs are most suffered due to ignorance and accurate knowledge. Several errors are happening while submitting the returns which leads to various errors and hence their claims are pending. Presently Officers are also not able to help them and only can show smooth as the systems do not permit even the Officers to correct the errors. While we appreciate the importance of a robust system for GST network, it is absolutely necessary that minor errors happening to be rectified by the officers by producing required document by the Assessee so that the refund can flow freely. Similar to the invoice based correction allowed by Trade Notice issued recently Officers may be allowed to do corrections in case they are convinced on production of proof by the Assessee. Unless this implemented immediately the trade and industry is going to suffer heavily. Hence intervention of Finance Secretary is requested in this direction. Many times due to oversight the mistakes may be visible after submission. Assessees may be provided option to correct their return in a simple way whenever they find some mistakes. Many of the Merchant Exporters are not able to procure materials under 0.1% GST due to procedures devised including copies of shipping bill, invoices etc. which is practically difficult. Manufacturer supplies to Merchant Exporters are also reluctant as presently they are not able to claim refund of inverted duty. While noting the recent circular No.5/2018, please note that it is very much necessary to officers shold be given access to ament Shipping Bills which are gone to history. Many of the IGST refunds are struck due to mismatch of details in the Shipping Bills and the GST returns filed or due to some wrong declarations in the Shipping Bils like DBK code, etc. The Erros which are genuine in nature, shold be allowed to correct even if it gone to history. Exporters comes under State jurisdiction are complaining that their manual applications are not being processed/accepted promptly and huge number of documents is being asked. Even after submission of these documents, acknowledgement is not given promptly. It is suggested that Officers directly dealing with Assessees should be given training and motivation so that the interface between Assessees and Officers can be smooth. A Nodal Officer-Districtwise may be appointed by VAT Authorities to flag issues of exporters as and when required as several complaints are received by FIEO on non-acceptance of claims as well as negative attitude of the officers. The Tamil Nadu Government is requested to settle refund claims promptly and efficiently similar to the cooperation exporters are receiving from Andhra Pradesh and Karnataka.